What areas do you cover? Can I get a cleaning in my area? We currently service most areas in Simcoe County including: Barrie, Orillia, Innisfil, Thornton, Collingwood, Midland, Midhurst and others. Feel free to send us an email to see if we cover the area you live in. What are your rates? Can I just get a ballpark figure of how much it will cost to clean my home? Every home and family is unique. Our pricing structure is determined by a number of factors. Meeting with you in your home or office to do a brief walk through ensures you that our quotes are based on your individual cleaning needs. Do you bring your own cleaning supplies and equipment? Yes, you can relax knowing that everything is taken care of. We bring our own cleaning equipment and only use 100% natural, biodegradable, plant based cleaning supplies. Do you clean homes just once, or do you have to clean long-term? We are happy to offer services that suite your needs, one time cleans, weekly or bi-weekly cleans. How many people will be in my home during each cleaning? most times there will be two people (including the team lead) in your home. On rare occasions, there may be three people or one person. For example, if you need emergency help fast, the office staff may send three people to do the job. If your home is very small, one person may be able to complete the job quickly and thoroughly. Who will be cleaning my home? Are they bonded? All of our cleaners have gone through a rigorous screening program, they are 100% professional and bonded cleaners. What time will you be at my home? Can I pick the time? we offer a specific window of opportunity when our cleaners will arrive. If something unexpected were to happen our office or team lead will notify you promptly. 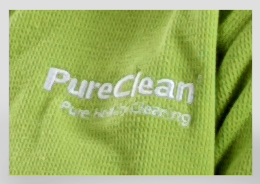 What is the difference between PureClean and another cleaning companies? We stand behind our promise. Were professional and bonded. We take our relationship with you seriously, follow up with a cleaning, ask how we can go the extra mile, and of course use only the highest quality natural cleaning products we help keep you and your family healthy. If you see a problem while a PureClean team is in your home, you can talk to the team captain, who will make immediate efforts to correct the problem. Or you can contact the office staff, who will work with the team to quickly correct the problem and enforce our guarantee. Contact our head office and we will get in touch with you with our gift certificate options. We are working on puting this all on our website shortly. I would like to give a gift card for a whole house cleaning. Can you tell me how much to spend? It’s very difficult to give you a price without seeing the home to be cleaned. We base our pricing on many factors, including the number of rooms, size of rooms, pets, clutter, and even the lifestyle of the homeowner (i.e., someone who is home a lot has very different cleaning needs than someone who travels a lot). For more help to determine how much to spend on a gift card that you intend for a whole house cleaning, please contact us here and we'll be happy to help you. Please contact our office to discuss employment opportunities. No harmful chemicals in the air and left behind on your floors, furniture and appliances.